Isn’t it sweet how saying, “I made this for you…” is just like saying “I love you”? If you love machine embroidery then this is the event for you! In just two days you’ll make six exclusive projects to decorate for your own tea party or share with someone sweet. 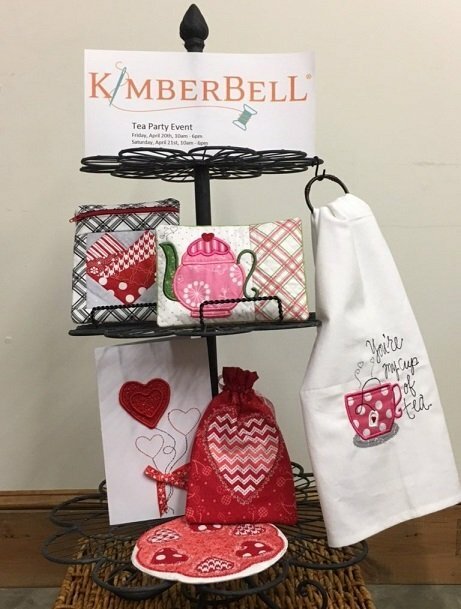 Create a quilted candle mat, a tea cup mug rug, and a zipper pouch that anyone would love. Improve your embroidery skills, learn new techniques, and have your cup of tea too! Bring your embroidery machine with hoop to accommodate 6" x 10" design and all your favorite tools. You'll need pink, white, gray, black, green, and red thread. The red thread will need a matching bobbin. Embroidery Machine owners who have purchased their machine from Find X Designs call for a $30.00 discount. Materials Included: Project kits, Stabilizer, Thread, Lunch, Snacks, Lots of Fun!